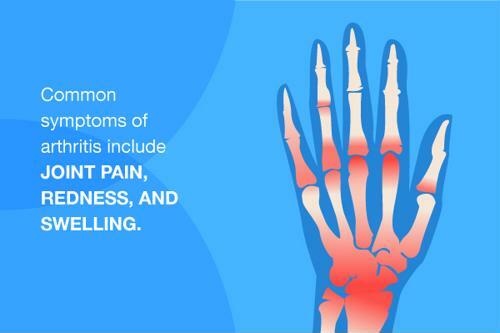 Recognizing the symptoms of arthritis can help you seek treatment. More than 50 million people in the U.S. have been diagnosed with arthritis by a physician, according to the Arthritis Foundation, and there are likely many more who are living with the condition but have yet to be formally diagnosed. And it's not just seniors. Cleveland Clinic reported that more than half of those with arthritis are under 65 years old. With the number of people diagnosed with this condition expected to grow to more than 78 million by 2040, it is increasingly critical to be able to recognize the symptoms and know when to consult with a physician. Arthritis is the general term for a group of diseases characterized by joint inflammation. According to Cleveland Clinic, this condition encompasses more than 100 individual diseases, including rheumatoid arthritis, osteoarthritis and psoriatic arthritis. These symptoms can come and go over time and are often associated with other health concerns, which sometimes makes it difficult to recognize that they're caused by arthritis. Consequently, it's critical to schedule an appointment with your physician if you suspect that you may have arthritis. The condition is usually diagnosed through imaging scans, such as those done by X-rays, computerized tomography (CT) or magnetic resonance imaging (MRI.) These pictures can reveal damage to your bones or loss of cartilage, which are telltale signs of arthritis. Pain is one of the most common symptoms of arthritis. If you're living with arthritis, there are a number of options that will help you manage the pain and maintain your quality of life. Though medication – both prescription and over-the-counter options – is common and surgery and other invasive measures are sometimes recommended, there are other complementary strategies that are simple, natural and convenient. For example, your level of movement can make a big difference. Harvard Medical School reported that it's important to remain active, getting up to stretch every 15 minutes when you're sitting or otherwise stationary. You should also avoid positions that put stress on your joints. According to Mayo Clinic, some people additionally have found success using different types of alternative medicine, such as acupuncture, yoga, massage and tai chi. Hot and cold compresses are also often recommended. If you're living with arthritis, you should consider trying one of the products from the IMAK® Compression line. The Arthritis Gloves, Arthritis Socks, Arthritis Knee Sleeve and other offerings are designed to help alleviate the pain, aches and stiffness associated with arthritis through mild compression that provides warmth and increases circulation. Made from breathable cotton, the IMAK® Compression products are comfortable, secure and easy-to-use. Be sure to discuss any treatment plan – as well as symptoms – with your primary care doctor.